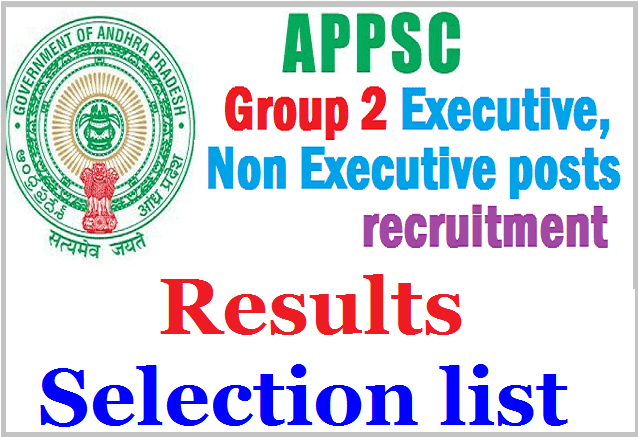 APPSC 1999 Group II Services Final Selection list/Final Results 2017/ APPSC #1999 Group 2 Executive, Non Executive Posts Selection List, 1999 APPSC Group 2 Posts Recruitment Results, Group-II 1999 Services Declaration of Provisional Selection List, APPSC Revised Provisional Selection Results of Group II General Recruitment: Notification No.10/1999-Recruitment of Group-II Services Declaration of Provisional Selection List press note: In compliance of the Hon’ble Supreme Court Orders dated in 18/02/2015 & 29/07/2016 in Civil Appeal No.5099/2006 and inconsonance of Presidential Order and G.O.P.No.763, dtd.15/11/1975, the Provisional Selection List of candidates (Register Numbers) for recruitment to the Executive posts fallen under Group-II Services Notification No.10/99 is available on Commission’s website i.e., www.psc.ap.gov.in . Selection Notification No. 10 /1999: In compliance of the Hon’ble Supreme Court Judgment dated 18/02/2015 and 29/07/2016 in Civil Appeal No. 5099/2006, the Commission has revised the selections in consonance with the presidential order, 1975. In the process, 1st spell of 104 (Executive posts) selections already made during 2000-2001 are not disturbed. Further, as per the clarificatory orders of the Apex court dated 25/09/2006 in I.A. Nos. 5 & 6 in Civil Appeal No 6758/2000, the earlier selections of 8 candidates under SC categorisation are not disturbed. Further, in compliance of IA No.s 33/2012, 34/2012 and 35/2012 dated 07/08/2014, 33 candidates selected as ASOs (state wide post under non-executive category) in the 1st spell are also not disturbed, as per directions of Supreme Court. The list of such candidates is available at Part - 1, Part - 2 and Part - 3. After consider the above, the following are the list of candidates Register Numbers revised and selected provisionally for Executive post under Group-II Services (General Recruitment) Notification No. 10/99, as per decision of Hon’ble Supreme Court in Civil Appeal No. 5099/06 are kept at Part - 4. The list of Non- Executive posts will be displayed within a week. 1. Non joining and unfilled posts which are carried forward to subsequent Recruitments are not included as they are not vacant. 2. The candidates who did not join in earlier spells due to which posts were carried forward to subsequent Recruitments are not considered because this is not a fresh recruitment. 4. If any case of dismissal due to miss-conduct or ACB action, the names would be excluded at the time of verification by the Unit Officer. 5. Re options are not allowed following decisions of the Hon’ble APAT in O.A.No.1952/2015 and batch dt:15/06/2015 as well as the present spell is not a fresh Recruitment. 6. Candidates who joined and resigned later on or left the service would not be considered because there is no vacancy in their case and the post is not pertaining to Notn No. 10/99. If any such names that the same would be excluded by Unit Officer during verification. 7. This provisional selection is subject to the final orders of the W.P.No’s 46191/2016 and 1299/2017 in the Hon’ble High Court as well as outcome of litigations pending before the Hon’ble High Courts of A.P. & Telangana and Hon’ble APAT. 8. In the case of Petitioners / Applicants in which even if a shift in the present post held by them is shown in the present List, no change will be made in the Unit list till finalization of O.A.No.5495/2013, O.A.No.4145/2016, O.A.No.20 to 31/2017, O.A.No.60/2017, O.A.No.153/2017, O.A.No.154/2017 & O.A.No. 356/2017 and W.P. No. 46191/2016 and W.P. No. The candidates may click on the required Parts to download the revised provisional selection list of Group-II Services, Notification No.10/1999. The selection for Non-executive posts (Part - 5 of the present list) would be published soon. Out of 931 Executive posts, 927 are filled at this juncture.